Governments and corporations are forcing utility ‘smart’ meters onto consumers’ homes saying that they give consumers control over their own energy bills. This propaganda-like message is quite misleading and more importantly completely ignores the tremendous financial, health, safety, privacy, and cybersecurity risks that smart meters impose on consumers and society . At this website through a variety of articles, many times highlighting published studies, we have shown how smart meter threats and risks far outweigh purported benefits. The great advantage that smart meter proponents have had in their fast-paced deployments is that the majority of consumers are generally not even yet knowledgeable on what is meant by the term “smart meter,” and consumers also tend to trust that something cleverly labeled as “smart” must be beneficial. The results of a new study, however, provide renewed hope that consumers will eventually reject smart meter technology in spite of governments and corporations which hype the purported benefits and are silent on the risks. The newly published article is entitled, “Understanding and Beliefs about Smart Energy Technology” . The study demonstrates that as consumers learn about smart meter technology, they become more aware of the potential risks and therefore have increased concerns about the negative impacts that smart meters may have on their lives. American survey respondents have very little knowledge about the smart grid. Exposure to smart meters increases this knowledge. 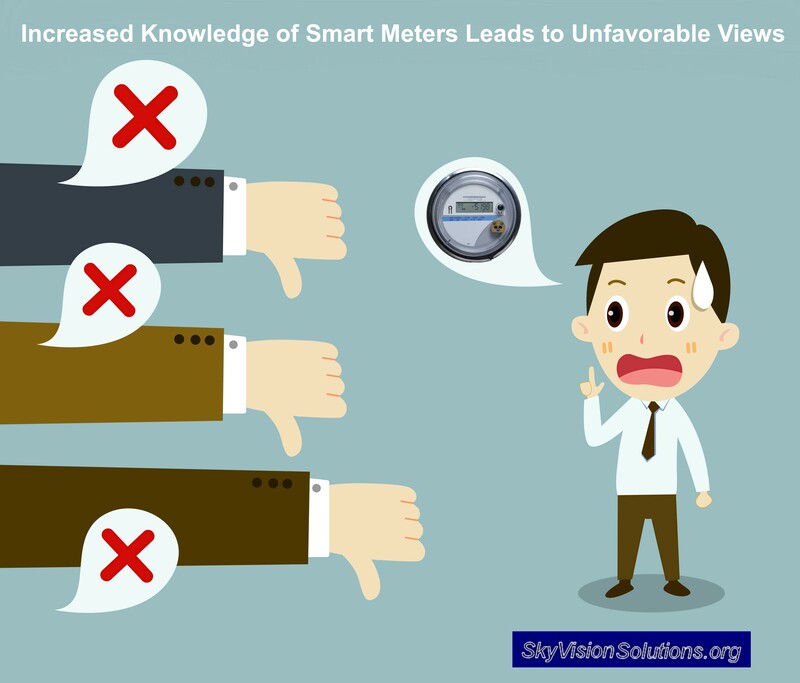 Knowledge and exposure are associated with negative perceptions of smart meters. Smart meters are seen more negatively than the grid as a whole. Negative reactions and unfavorable views of smart technologies among consumers are rising. However, a vocal minority has expressed concerns about the health, privacy, and cost impacts of the smart grid. Here we use a convenience sample of online respondents to quantitatively examine the American lay public’s level of knowledge about smart meters and the smart grid and show that a majority of respondents are wholly unfamiliar with smart energy technology. We “westerners perceive” our homes as private spheres over which we should have control. Silly us. Is there a question on whether this should be true? Isn’t privacy and control in our homes a matter of having citizen rights? In this instance the authors recommend that consumers be provided information in a way that downplays the privacy and security risks for those who perceive that they should have privacy and security in the home. I agree that consumer “personal” concerns need to be addressed, but they also need to be acknowledged as representing legitimate concerns that are based upon real threats and risks posed by smart grid technology, not just as a problem with messaging. The good news is that the study documents quantitative research that consumer concerns over smart meter technology increase, not decrease, as they learn more about it. It is the purpose of this website to be continued a source of objective information from which consumers can further increase their awareness of the threats and risks posed by smart meters and smart grid technology. Privacy invasions due to granular collection of energy usage data which represents a “gold mine” to others. 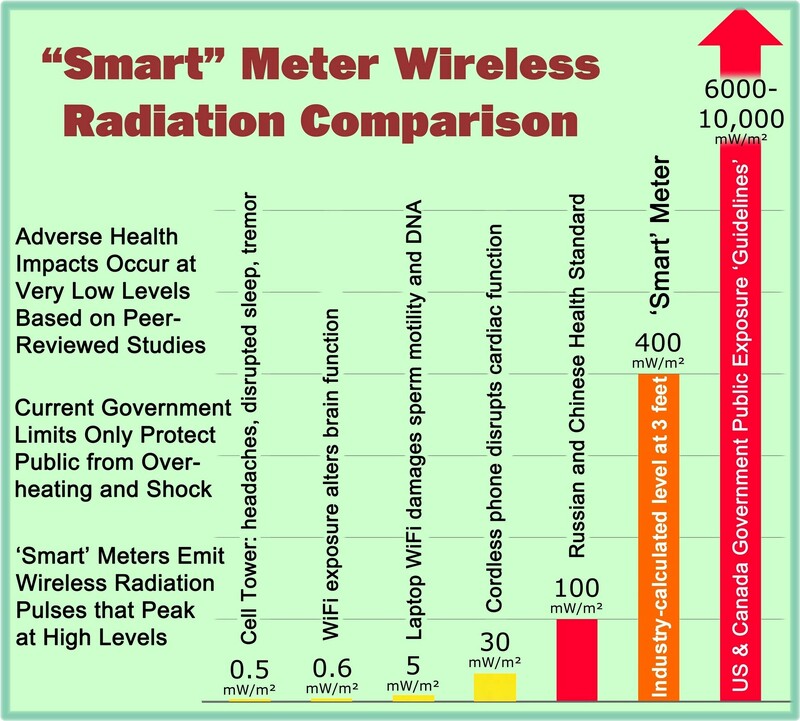 Potential health risks and actual adverse health effects caused by the additional electrosmog created by the smart meters and their associated infrastructure. The increased risk of household fires due to smart meter safety issues and ‘catastrophic failures’ that are expected with smart meters as opposed to traditional usage meters. Societal implications of smart grid and smart meter cybersecurity threats which can result in catastrophic events affecting widespread areas of the electric grid. In addition, for those few consumers who might be motivated in an attempt to use smart meters to somehow conserve energy, they will pay a yet to be quantified price related to losing control over one’s appliances, quality of life, comfort, and health. Copyright Notice © SkyVision Solutions and Smart Grid Awareness, 2013 – 2016. Unauthorized use and/or duplication of original material from this site without express and written permission from this site’s author and/or owner is strictly prohibited. Excerpts and links may be used, provided that full and clear credit is given to SkyVision Solutions and Smart Grid Awareness with appropriate and specific direction to the original content. Material presented in this article is presented in the public’s interest for non-commercial purposes. SkyVision Solutions does not imply any exclusive right to preexisting material contained in published works highlighted in this article. This entry was posted in Smart Grid, Smart Meters, and RF Emissions and tagged Costs, Health Concerns, Privacy, Smart Grid, Smart Meters. Bookmark the permalink. Here is Sacramento, SMUD has decided that even though they originally published that there were “only six smart meter transmissions per day” and we showed them it was actually 13,381 transmissions per day, to which they admitted, SMUD would not go back and disabuse the customer. Probably because it would lead to customers demanding the analog meter back. Choice in a democracy is paramount ! Everything comes after !